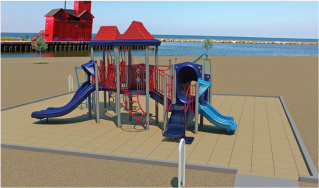 Like a similar project at Grand Haven State Park a couple years ago, LMCU has jumped into a fundraising initiative aimed at providing a new children’s playground at the Holland State Park beach. LMCU listened and acted, contributing $35,000 toward the project’s $65,000 total cost, with the remainder funded by other charitable contributions. The partnership quickly grew to include the Department of Natural Resources (DNR), Lakeshore Advantage, Michigan Economic Development Corporation (MEDC) and Michigan State Housing Development Authority (MSHDA). Michigan-based Patronicity was tapped as the crowdfunding platform. Funds will be funneled through Carter Oosterhouse’s nonprofit charity, Carter’s Kids, which will purchase and deliver the equipment. Actual installation will be performed by a team of LMCU staff volunteers. This fundraising campaign raised the $17,000 required for matching funds to be granted through MEDC’s Public Spaces Community Places program. Thank you to all who contributed, making Sally’s inspiration a reality.